To expertly guide you through the sleep medicine consultation, diagnosis, and treatment process, while offering ongoing assistance in cultivating healthy sleep practices for life. At REMedy Sleep Medicine LLC, we take pride in our ability to guide our patients through every step in the sleep medicine process. With over 49 combined years in medicine, 18 of which have a primary focus in sleep medicine, we’ve seen first-hand what a big difference proper sleep can have on your overall well-being. We believe this gives us a genuine investment in our patient’s care that sets us apart. Learn more about snoring and sleep apnea here. Meet Our StaffWithout them, we're nothing. Carole Guillaume, MD, FAASM, is a graduate of The University of Kansas School of Medicine and has been practicing medicine for 20 years. 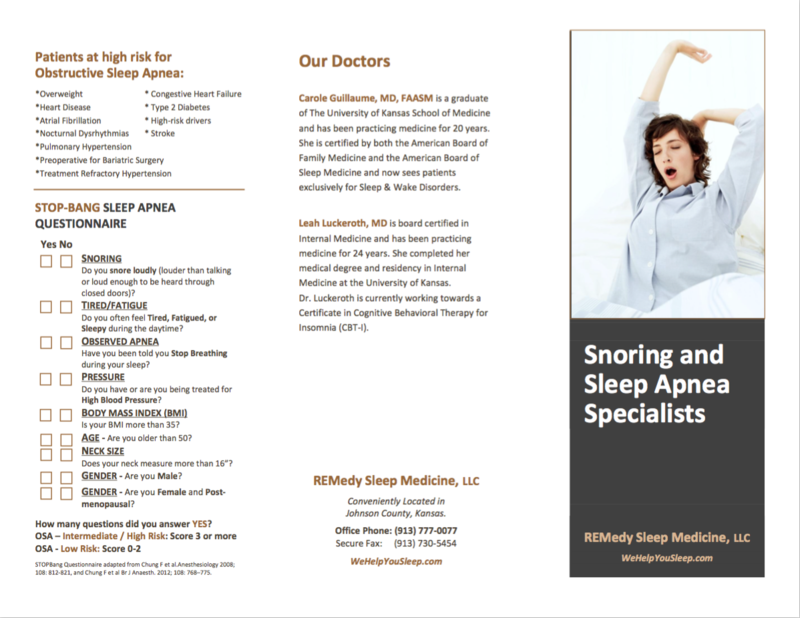 As a Diplomat, American Board of Sleep Medicine, she has created an exclusive sleep medicine practice with a special focus on Obstructive Sleep Apnea diagnosis and treatment management. Leah Luckeroth, MD, is board certified in Internal Medicine and has been practicing for 26 years. She completed her medical degree and residency in Internal Medicine at The University of Kansas School of Medicine. Michael has been a Registered Polysomnographic Technologist for 7 years. He was trained in Mesa, Arizona. Oleg has been a Registered Polysomnographic Technologist for 15 years. He attended school at the Izhevsk State Medical Academy, Udmurt Republic, Russia. Quality sleep is just as important as quantity! ServicesSee Below, You Might Be Interested! At your first appointment, a thorough review of your sleep habits, symptoms, family history, bed partner observations, and medications will help us determine the best course of action on your road to diagnosis and treatment. The home sleep test (HST) is a small device worn for a 1 to 3 night period in your own home. This device is used in the initial diagnosis process for Obstructive Sleep Apnea and Central Sleep Apnea. We offer the convenience of diagnostic and therapeutic overnight studies right here in our convenient facility. This provides a level of comfort that is not seen in hospital-style atmospheres. Once treatment has begun, we closely monitor your progress through a series of follow-up office visit and data downloads directly from your treatment device. As part of our full-service approach, we are able to guide our patients through each step of the consultation, diagnosis, and treatment process. Once your initial consultation is completed, we offer the convenience of home sleep tests and overnight sleep studies in our own office. Patients have found that our relaxed atmosphere makes them feel far more comfortable versus the more common, hospital-type sleep labs. Obstructive sleep apnea (OSA) is found in 30%–40% of hypertensive (high blood pressure) patients and 60%–70% of patients with hard-to-control hypertension. FAQIf you don't find your answers here, feel free to contact us with any questions! There are several different types of sleep apnea, each a little different. Obstructive Sleep Apnea, or OSA, occurs when your throat muscles relax during sleep, causing airway closures and a reduced blood oxygen level. Snoring, loud snoring, restless sleep or pauses in your snoring / breathing can be the first signs of a problem. Central Sleep Apnea is a disorder caused by the inability of your brain to send signals to the muscles that control breathing. Either type will negatively affect your ability to get a good night’s sleep and be refreshed for the coming day. Do you snore or do you have snoring loud enough to disturb your bed partner? Have you been told that you have pauses in your breathing for periods during sleep? Do you have restless or fitful sleep? Are you excessively tired during the day even after a full night in bed? During the day, have you noticed poor memory or difficulty concentrating? Do you or others notice you have increased irritability or less energy? These are only a few of the many symptoms that OSA can present. Do you feel the quality of your sleep is poor? If it has crossed your mind that your quality of sleep is lacking because of an uncomfortable bed or the stresses of everyday life, you might be surprised to know that sleep apnea can often be the underlying culprit in many of these issues. At your initial consultation we will begin the process of pinpointing the reasons for your poor sleep and get your evaluation started right away. How does sleep apnea affect your overall health? The repeated awakenings caused by OSA can make restorative sleep impossible. General fatigue, irritability, or difficulty concentrating can add unnecessary strain to your everyday life. In addition, for patients with possible underlying heart disease, diabetes or other chronic medical conditions, OSA can worsen the prognosis and risk of obesity, high blood pressure, heart attack, stroke, or memory deficits. How can you get started on your treatment? The first, and best, stop on your road to treatment begins with an initial consultation with your sleep medicine doctor. At this visit, you will discuss your sleep habits, what you or your bed partner have observed, and any negative symptoms keeping you from getting the most restorative sleep. After consultation, a home sleep test or in-lab overnight study may be ordered to determine your diagnosis. Will insurance cover your testing? We are in-network with most insurances and will begin the prior authorization process for any sleep studies at the time of your initial consultation. Here are just a few examples: we are a Medicare provider and are in network with Blue Cross Blue Shield and Coventry. For our patients who would prefer to go the self-pay route, we offer competitive pricing and payment options. Please call our office to discuss. You’ve heard home testing can now be done, do you even need to do an in-lab study? Home sleep tests are far more advanced than ever, but at this time they are limited to the diagnosis stage only. An in-lab titration study is still the safest, best and most accurate way to get started on the correct treatment for your specific needs. Why do an in-lab study? In-lab studies allow us to measure many things that a home sleep test simply cannot. Our technicians closely monitor variables such as: heart rate, oxygen level, muscle activity, brain wave patterns and more. During your in-lab study, our technician will also fit you for the mask geared to provide you with the most successful treatment. A properly fitting mask is one of the most important aspects in your treatment. Have you had a previous diagnosis of sleep apnea or have you tried CPAP or BiLevel therapy in the past with less than ideal results? Treatment masks and technology continue to improve and your ability to successfully receive treatment is better than ever. You can be assured that we stay up to date on the latest technology and practices. We will be glad to assist you in addressing any complaints you’ve had with your prior treatment and help you re-start therapy again. Is it too late for you to receive treatment? It’s never too late to start treatment! Sleep apnea often worsens as you get older and if you’re tired of being tired, contacting us now can be your next big step in getting the treatment you know you need! Copyright © 2018. REMedy Sleep Medicine, LLC.